It’s been 6 months since I broke my ankle and I’ve been back running for 2 of those. When I say running, some of these runs were more of a shuffle or speed walk depending on the pain, but it’s 2 months of moving, using Strava and feeling that runners high again. In those 2 months I have increased my pace by 3 minutes, from around 16min miles to 13min miles. I’m currently 1- 1:30mins off my pre-injury pace of 11:30-12:00min miles. But I’m proud of my progress so far. My day to day run is two miles but now I’ve started back on a training plan I achieved a 6.5 miles run last weekend. 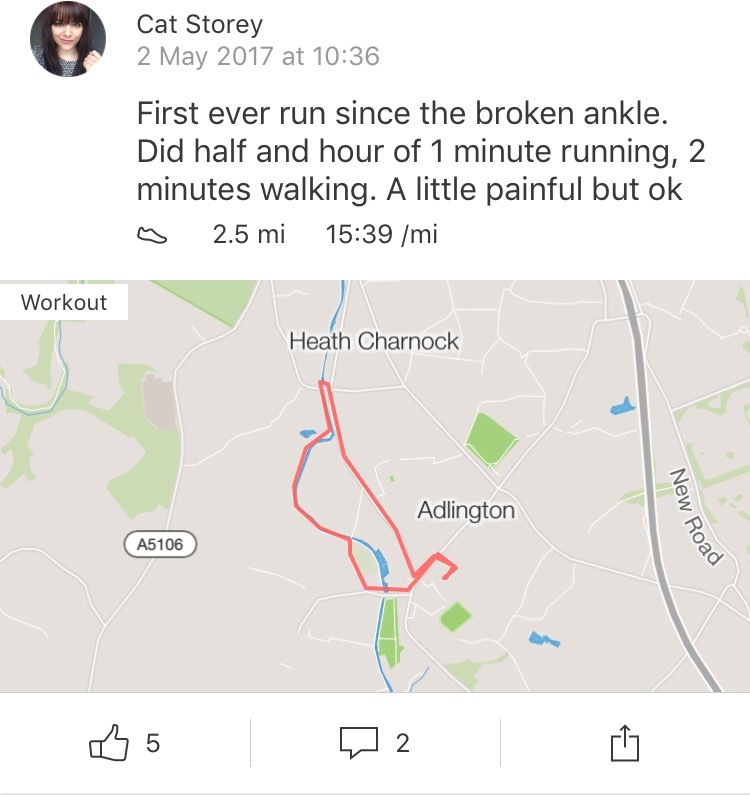 My journey back to running has had many ups and downs and there’s been times when the pain was too much so I’ve resorted to walking, coming home and having a little cry in frustration. However I’ve always picked myself back up and tried again. Alongside my journey back to running I’ve continued my rehab exercises and stretches to ensure my ankle gets back to full mobility. My next goal now I’m back to running is to complete a half marathon this year. This was always my 2017 aim, even before my injury, however my injury made me question whether it would be achievable. Prior to breaking my ankle I had entered the ballot for the Great North Run so since my injury I’ve been trying to work out whether I’m best deferring my entry until next year or giving it what I can this year. I have until July to make this decision and based on my 2 months of running I’ve decided to give it my all. If it means on the day I walk more of it than run I will still be proud of my progress over this year. 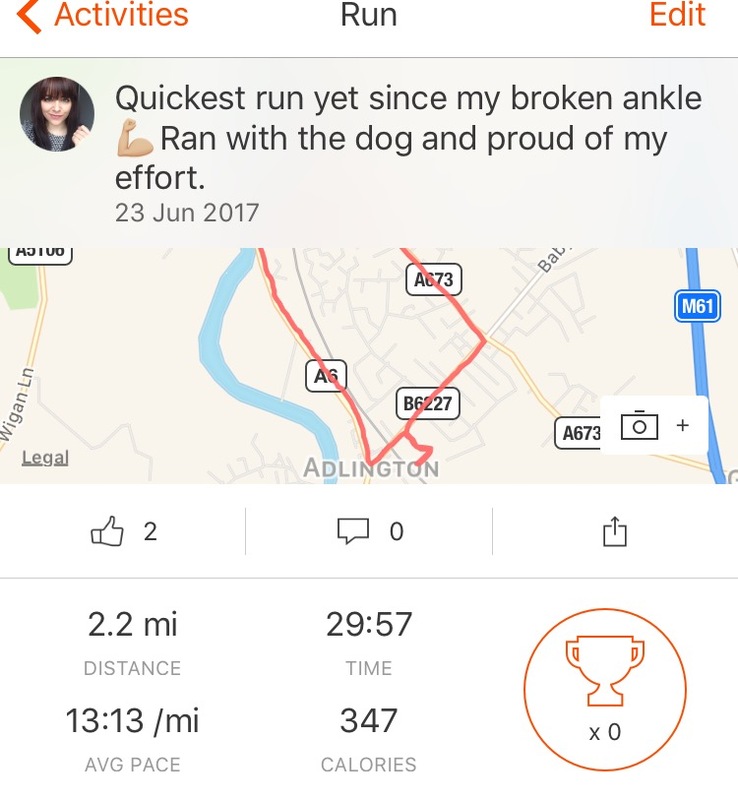 I’m currently 6 weeks into a half marathon training plan and I’m currently feeling confident. I’ll continue to listen to my ankle but for now I will be crossing the start line of the Great North Run in September. Here’s hoping I will make it to the finish!